Ms Nafissatou Diouf, Communication and External Relations Department of the bank made this known in a statement in Abuja on Friday. 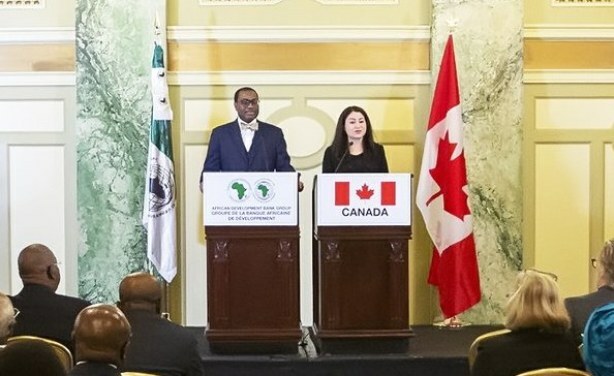 “I am happy to say that today, Canada is demonstrating its commitment to African countries and our confidence in the AfDB by announcing that we are going to subscribe up to 1.1 billion dollars in temporary callable capital, if required. “The AfDB is a key partner for Canada and we are committed to supporting the bank’s African member countries. “Canada and Canadians are proud of our long history of partnership and collaboration with Africa. “Canada is determined to ensure that no less than 50 per cent of bilateral development assistance is dedicated to sub-Saharan Africa by 2021-2022” she said. According to Adesina, the support will allow the bank to strengthen its Triple A rating and increase lending to member countries. “Discussions are ongoing among all shareholders for a general capital increase. “Your announcement is a clear indication that Canada has strong confidence in the AfDB. “While extending the bank’s appreciation to Prime Minister, Justin Trudeau for Canada’s unwavering support for the bank” Adesina said. She disclosed that in all general capital increases of the bank, it provided temporary callable capital in 2010 while the GCI VI negotiations were ongoing. “As at 30 June 2018, Canada’s total capital subscribed amounted to 3.5 billion dollars of which 252 million dollars has been paid in and 3.22 billion dollars stands as callable capital.” And that makes Canada the fourth largest shareholder among the bank’s non-regional member countries,” she added.